The uniqueness of my fiber art developed from a passion for baskets, horses and Spanish metal work. 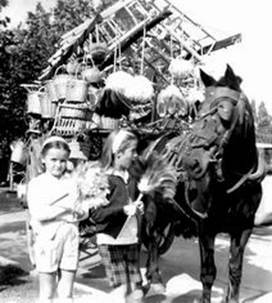 My love for baskets and horses began at an early age when I would wait on Saturday mornings in Argentina for a horse drawn basket cart to pass in front of my house. As it approached I would run out of the house and admire the utilitarian baskets piled high on the cart and the wonderful horse that pulled them. My enthusiasm for horses has been with me ever since I can remember and I have always had them in my life. The art that I create pays homage to the horse, without which our history in the West would have been very different. My fascination with the early Spanish metal work has inspired my hand stamped sterling silver basket bases. My art reflects a personal interpretation of these diverse interests. I created my first horsehair basket in Santa Fe in 1992. The art of basketry appeals to me because it reveals both the environment and cultural surroundings of an artist. My art is tied to the land, steeped in history and tradition, but always moving forward with an intrepid creative spirit. I’m the one tickling the horse.